Body Brushing - Exfoliate and Invigorate Your Skin with Natural Loofahs - Amphora Aromatics Ltd – Supplier of pure essential oils and aromatherapy Products. Hi all, Sophie here with my last blog on Amphora’s lovely range of Loofahs and Brushes. In this post I'll be explaining why using natural Loofah brushes is so beneficial to your skin. Click to learn more. I hope you have enjoyed my previous blogs in this series. This blog is all about Loofahs. They’re made from the natural fibrous material from the dried fruits of a tropical climbing vine. Loofahs are usually pale straw like in colour and have a slightly herbaceous smell to them when new. The spongy texture is perfect for exfoliating and invigorating skin leaving it feeling soft and smooth. It can help stimulate blood circulation. Loofahs are rough in texture when dry but once water is added they become soft and supple - although they do harden again once dried. The warmer the water, the quicker the loofah becomes soft. If you are looking for a rougher exfoliation then just add a little water to the loofah. It will then retain some texture and give you a deeper exfoliation. We stock a range of different sized Loofahs including the Loofah Back Brush, the Loofah Facial Pads, the Loofah Body Rub Palm Pad and the Flat Loofah Brush. Loofah Facial Pads come in a pack of 5 and are perfect for use with your favourite cleanser to help gently exfoliate the face and neck and stimulate circulation. You might like to use them in conjunction with this lovely new Lavender and Tea Tree Facial Wash. It’s the perfect choice for oily, congested skin and can help clear blemishes. The Flat Loofah Brush is a 10 inch brush that is great for use all over the body. It’s especially good for use on legs and arms. 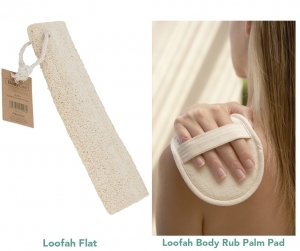 Loofah Back Brush has a long wooden handle which is great for exfoliating all over the body, especially those hard to reach areas around the back. A good wash to use would be Amphora’s all-natural Tea Tree Shower Gel. Paraben and SLS free, this gel is a great antiseptic, anti-fungal and antibacterial wash perfect for use all over the body. Simply pour a little of the gel onto the wet loofah - a little will go a long way once you begin to scrub. The Loofah Body Rub Palm Pad fits over the hand and is that little but more ergonomic, allowing the wearer to concentrate on the job in hand (excuse the pun!) rather than worrying about maintaining a grip. To use, gently but firmly rub whichever Loofah you've chosen against the skin in circular motions. This will help remove dead skin cells and stimulate blood circulation. Once you have used the loofah over all your body, rinse your skin with cool water to will help close the pores and leave you feeling refreshed. After each use make sure you rinse your loofah with hot clean water, making sure all soap is washed out and leave it to air dry. It is important to dry the loofah completely between each use as this will prevent bacteria from growing. It is very important to make sure you sanitise your loofah at least once a week as they can harbour a lot of bacteria if left. You can run it through a hot wash cycle with your towels or boil it in hot water for several minutes to kill any bacteria that might be growing. Do this at least once a week to make sure the loofah stays healthy to use. It is also recommended that replace your loofah every month or so. Thank you for reading! In my next series of blogs I’m going to be going into more detail about our fabulous Floral Waters so be sure to check back again soon. You can see all of my other blogs by clicking here.